The K3-Tent Suite provides the ability to draw up architecture, construction, and manufacturing documents required to make tent structures of any complexity. K3-Tent software simulates the shape of a "soap film" surface for a specific frame. K3-Tent software simulates a soap film surface shape for a specific frame when retrieving it from the soap solution. The frame may be composed of rigid or stretchable (rubber) ribs. The designer creates a frame consisting of straight sections and arcs. The designer sets the frame rib boundary conditions (loose, hold fixed, fixed length, etc.). The designer specifies if a facet should or should not be used in creating a surface. The software automatically calculates the shape of the envelope. The designer checks the correctness of the shape by using an isoline plotting tool and a heat normal map. The designer marks cutting lines on the envelope. The software automatically cuts the envelope into pieces and unfolds the pieces. The software can be used to export unfolded pieces to .dxf format. Supported operating systems Windows 2000, Windows XP. 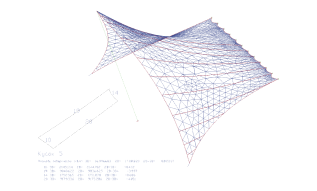 Creation of the Frame object on the basis of set of spatial straight lines and circle arcs which defines links and tent constrains. Definition of boundary conditions for the Frame edges and nodes. Creation the surface of the tent by the system automatically. Tracing cutting lines on the surface of cloth. The system cuts the tent surface to patches automatically. Development patches pattern by the system automatically. Fabric patterning, cutting, welding and tent surface assemblage. To create a tent structure, the system uses a special object called Frame. A frame is a set of interlinked spatial lines. These lines are straight sections and/or arcs. A frame is a template for the future tent structure. Frame nodes shall correspond to the awning cloth fastening points. Closed topological triangles or squares of the frame are automatically perceived by the system as cloth pieces. Therefore, the designer must make sure that there are no triangles or squares on sections of the structure not to be covered with cloth. The designer's task is to create a frame. The system automatically finds the cloth surface. The implemented algorithm ensures that the cloth surface has no "bubbles," folds, etc. Creating the cutting pattern for the designed awning cloth is one of the most important and critical stages of the design. The cutting pattern means dividing the awning cloth into individual pieces and then generating a flat pattern for each cloth patch. When dividing the cloth into patches, it should be kept in mind that each patch is a part of the surface with double curvature, which cannot usually be unfolded precisely. We call this unfolding procedure "2D mapping," and it can only be done approximately. The less the cloth circuit’s Gaussian curvature, the higher the accuracy of the 2D mapping. Normally, 2D mapping allows patterns to be generated with linear sizes 1%–2% lower than that of corresponding lines on a curved surface. Therefore, a suitable tolerance must be applied for the cutting pattern. The designer plots mark lines and cutting lines (future seams) on the created 3D model of the awning. Several different line plotting algorithms are implemented in this version of the system, including an algorithm for plotting the shortest path between two arbitrary points. The K3-Tent suite allows the designer to automatically generate cutting patterns for fabric cloth patches. The designer only needs to specify the required piece or select all pieces of a cloth. The cutting pattern can be exported to .dxf format for future use. This module serves as a basis for the K3-Tent software suite. It is designed for creating, storing, and supporting the 3D model. 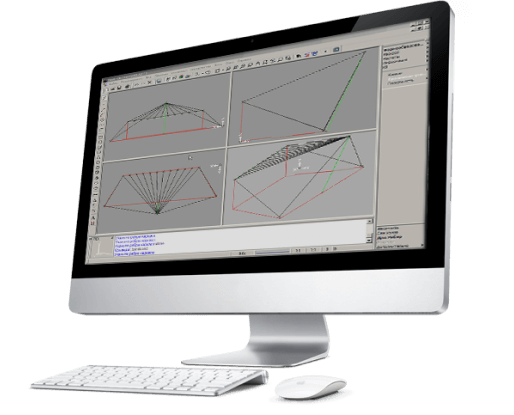 In essence, K3 is a ‑ suite of geometrical solid-state 3D simulation software capable of resolving various engineering tasks. A set of linear objects and solid-state objects are used in this suite as the standard basic modeling elements. All the objects are located in 3D space. Linear objects include point, section, arc, circumference, spline, and contour. There are no restrictions for plotting linear elements, such as the need for placing contour points in the same plane. Solid state basic elements include: a rectangular block, cylinder, cone, sphere, torus, prism, pyramid, ellipsoid, and spherical zone. K3 software can be used to obtain a number of mechanical properties by using one command for a selected object or a group of objects. These properties may include calculated volume, surface area, weight, inertia moments, etc. The model appearance is not the only feature giving a full understanding of a subject. A significant amount of information not related to geometrical properties is typically related to particular objects. For example, price, part number, date of manufacture. To give a full understanding of a model as a real-life object, the suite allows nongeometrical information to be assigned to objects. The information is presented as attributes—that is, ‑ numbers and texts. The user is free to define the quantity of required attributes and assign their names and types. An already created attribute can be further assigned and edited. K3 software ensures transmission of object-related information to different databases through the ADO interface. This property makes it possible to easily receive, for example, a list of equipment placed in a room. K3 may use other data storage methods. The advanced data import/export subsystem allows geometrical information to be exchanged with other widely used systems. Used file formats include data storage formats such as DXF, FRG, HPGL, and STL. This module is designed for creating a 3D model of an awning. 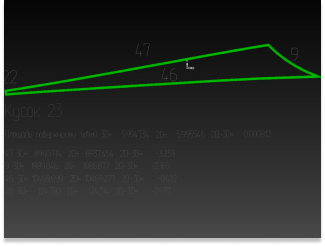 The module allows 3D coordinates to be set for assigned awning nodes and ribs. Define boundary conditions. 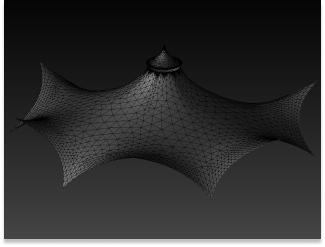 Based on this information, the module automatically finds the shape of an envelope as the minimum surface area. This significantly simplifies and speeds up the creation of the awning surface, thus ensuring fast and high-quality iterative selection of a large number of shape options. 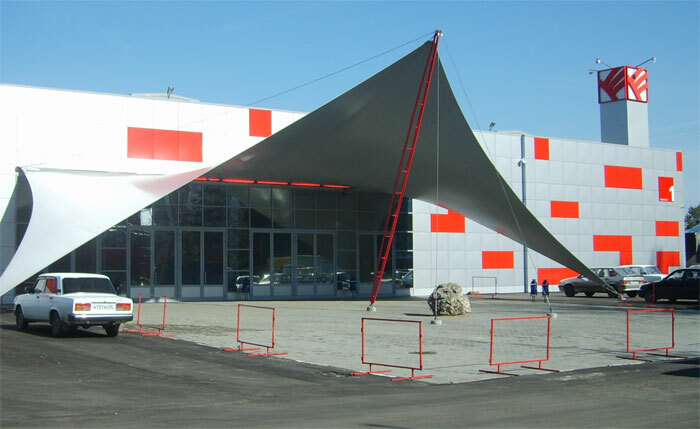 This module is intended for performing design work associated with fabrication of the awning. 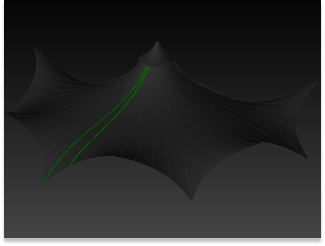 The module allows cutting lines to be plotted and lines to be marked on a surface. Cut a surface in pieces. Calculate the area and side lengths of the pieces. Generate cutting patterns—that is, unfold the pieces. Transmit data to external systems using graphical format.